But before we get to that, let's talk about how the bike looks. 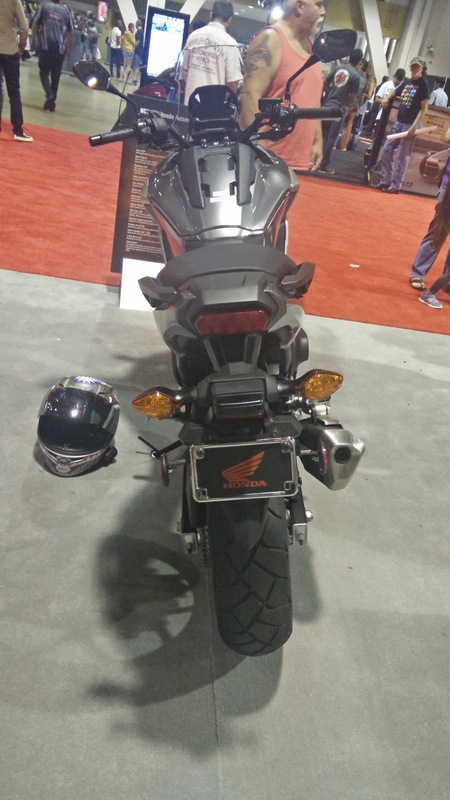 At first glance, it appears to be a tallish bike, almost looking somewhat adventure bike-like in its height. 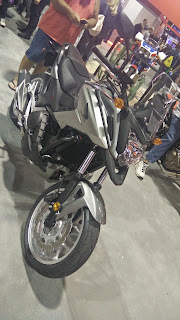 To me the comparison to such bikes like the Kawasaki Versys and Suzuki V-Strom do not feel out of place. 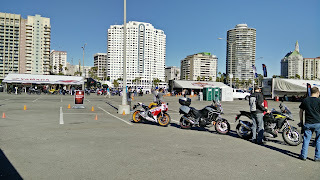 They are all tallish bikes with engines displacing around 650cc in some form of a twin configuration. While the Versys and V-Strom aim for a more urban machismo kind of vibe, the Honda feels a bit more restrained. The cues are there, but somehow more toned down to make the Honda feel less intimidating. There is also a bit more visual bulk to the Honda, making it come across somehow a bit more docile than the designs of either of its main competitors. All of that to say that the NC is neither an attractive or unattractive bike, nor is it particularly masculine or feminine. In many ways, it sort of rides that line right in between, giving it equal chance to both entice and offend a potential buyer. I am not sure if that is a good thing or a bad thing just yet. Sitting on the bike, the stance is definitely tall, with my 31-inch inseam legs just barely able to get the balls of both of my feet fully down on either side. Luckily, Honda did a good job in sculpting the seat to allow as much clearance as it could, but shorter riders are likely to find the bike a bit of a stretch. Once seated, the reach for the bars is extremely comfortable and works well to provide a near totally upright seating position. Pegs fall logically right below the rider's hips to complete that upright seating position, but unfortunately are set a touch high for riders with even average length legs. I personally found them a bit cramped, but your mileage may vary. Instrumentation is clear and simple with easy to read, if somewhat plain looking gauges, that utilize a digital speedometer and tachometer. Fuel level and gear indicators are included as well as the usual bevy of indicator lights. Nothing about the rider cockpit stands out much until you reach for the grips and realize that the bike is missing a clutch and has a few strangely labeled buttons. 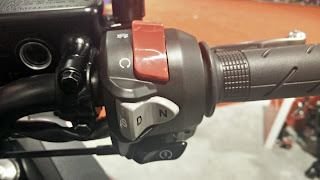 Since my bike is a DCT model, in place of the clutch are a pair switches labeled with a "+" and "-" along with a bulky plastic handle that actuates the parking brake. On the right side switch cluster is a rocker switch labeled with "S-D-N" that is used to indicate the drive mode. It is all a little disorienting at first, much like the rest of the riding experience. Luckily, the starter switch is exactly the same as on most bikes so I lift the bike off the rather flimsy feeling side stand and flick the kill switch to the "ON" position before tapping the starter. The bike fires up without hesitation and settles quickly into a thumpy idle, typical of a twin. Honda has elected to use a 670cc parallel twin that puts out a rather anemic sounding 51 hp and 45 lb-ft of torque. Of course, the numbers alone do not tell the whole story as the low-revving twin actually feels surprisingly strong in the low and mid RPM range where most riding is done, allowing for effortless riding in urban environments where stop signs and traffic lights abound. Coupled with the DCT, the bike is definitely not going to pick off any unsuspecting victims at a light, but does offer sufficient power to pull away from a stop with authority, if not quite a quickness. At least the parallel twin is set low in the chassis for an extremely low center of gravity and is paired with a throaty, although not particularly audible, exhaust system. The riding experience is where this bike starts to seriously depart from anything I have ever ridden before. 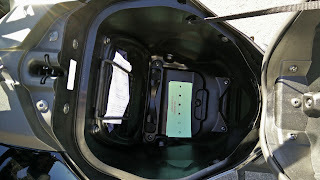 To place the bike into gear, you press the "D" part of the rocker switch on the right switch cluster which is followed by an audible thunk at the bike pops into gear and there is a slight tug forward before the computer disengages the clutch. 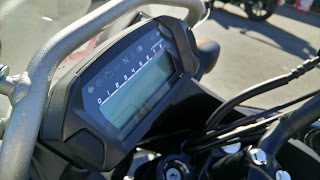 Even with the bike in gear, stay off the throttle and the bike will sit totally still, as though it were in neutral, the computer holding the clutch in anticipation of your pending departure. Twist the right grip and with just a hint of hesitation, the computer slips the clutch just the right amount to allow for a smooth take-off. 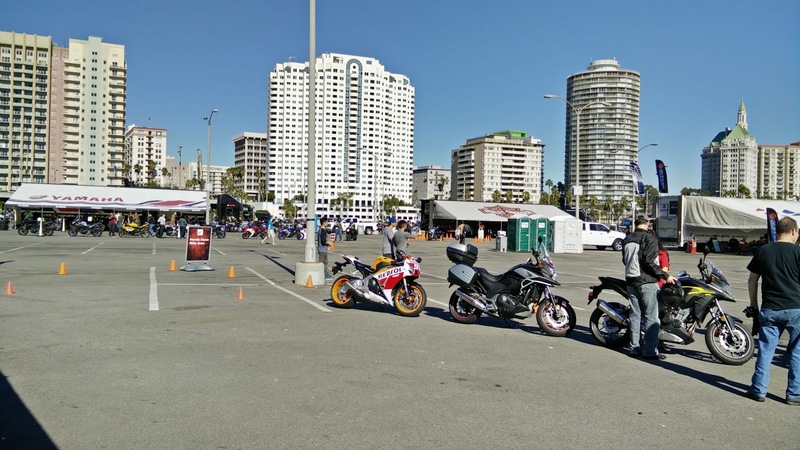 Stay on the throttle and the computer determines the ideal gear to select for that moment, allowing the rider to consider absolutely nothing except the throttle position. Taking a moment to reset my now job-less clutch hand so that I could better reach the switches on the left cluster, I set off after the group I was riding with. Rolling along, the bike actually feels very natural. 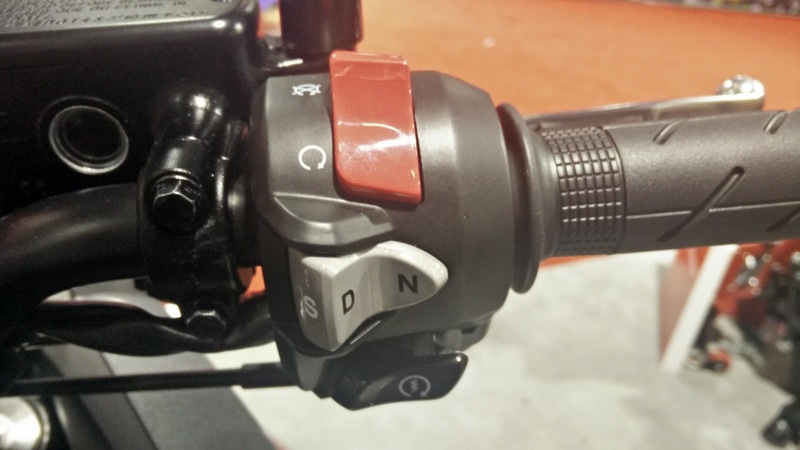 The shift points are almost imperceptible as the DCT smoothly transitions between gears and the lack of any physical feedback when gear changes took place certainly required some getting use to. Once my brain had reprogrammed itself to deal with this new paradigm, I easy cruised along without issue. Coming to a stop, my jobless clutch hand grabbed fruitlessly for the non-existent lever for the first few lights, but quickly adapted to simply staying put. At each light, the bike's brain smartly decoupled the clutch and the bike idled effortlessly. As long as I did not move the throttle, the bike simply sat still. It is definitely a trip to try this for the first time. As we rode along, blasting along a few highways and navigating some neighborhood streets, I got increasingly comfortable with the bike. It handles easily, thanks to the lower center of gravity from the heavily forward canted motor and the gas tank that hides beneath the seat. By placing all of this mass closer to the ground, the bike handled confidently and in combination with the wide bars, was extremely easy to toss around. The forks and rear shock felt adequately damped for urban commuting, but push a bit harder and it quickly became clear that the steering is more than a bit vague and that any serious riding would likely get this bike into trouble quickly. Brakes - single discs front and rear - offered adequate, though not exactly amazing, stopping power while, like the steering, lacking any real feel and feedback. It all makes for a comfortable and plush ride, but any thoughts of using this as an only bike would quickly go out the window without some serious suspension upgrades. It was also running around the neighborhood roads that I discovered a few holes in the transmission's programming that caught me off guard. One tendency of the DCT is to seek out the highest possible gear as quickly of possible in the name of fuel economy. 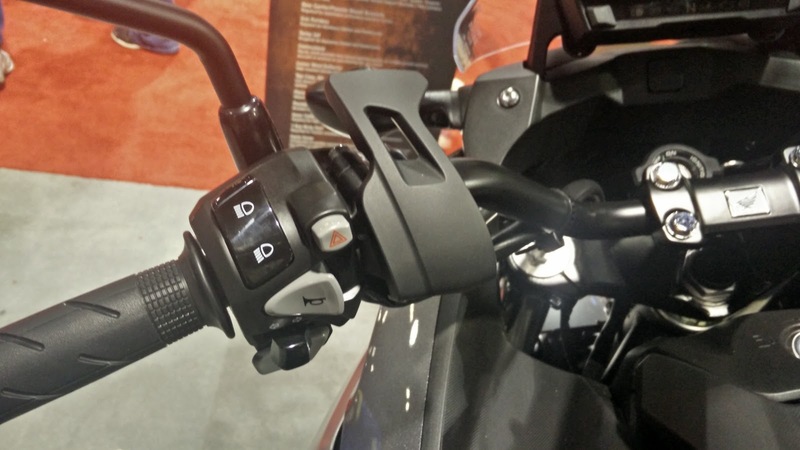 This is not atypical for automatic transmissions these days, but on a motorcycle, if the transmission opts to shift mid-corner, the sensation is more than a bit alarming at first. Imagine being mid-way into a slow right-hand corner at an intersection and with the bike leaned over a fair amount, you suddenly hear the engine's RPMs drop. Because the DCT is so smooth, there is no upset to the traction and there are no averse consequences, but it is disconcerting as hell the first few times the bike chooses to do that. This can be overcome by keeping the bike in manual shift mode or even by using the sport mode, but since I was riding this thing like a sensible commuter, I had this happen several times in regular "D" mode. Not a deal breaker, but definitely something a rider considering the DCT should be aware of going in. For a new rider, this might be fairly easy to get used to quickly, but for someone who has a few years of riding under their belt, it is going to take a little re-calibration. Eventually, we cruised back to our starting point and by this time, I had a pretty good feel for the quirks of this rather unique bike. That DCT is definitely a serious piece of engineering wizardry. For someone new to motorcycling, especially if they do not drive manual transmissions to begin with, it lowers the barrier to entry significantly. Even for an intermediate or advanced rider looking for a much more relaxing ride, once you get used to the quirks, it is an excellent choice since it really simplifies the ride tremendously. The NC itself is also an enormously practical bike. A trunk and saddle bags are available accessories that offer tons of storage and the bike has a built-in compartment, located where one normally finds the gas tank, that is large enough to swallow a full-face helmet. 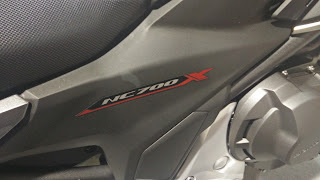 As an urban commuter, Honda has thought of virtually every little detail with the NC700X.